Americans love food challenges. It hardly matters if the dare is to consume 12 habanero infused wings in under 10 minutes or take down an 11-pound carnivore pizza in one sitting, we can’t help but watch other people suffer as they attempt these memorable feats. Heck, there’s even a television show called Man VS Food that has run for 6 seasons based on the simple premise of completing food challenges. We can’t get enough of this stuff! And while the internet and food television has graciously brought to light many of these foodie feats, the original and still most well-known is the ice-cream eating challenge. The ice-cream challenge likely brings memories of your youth rushing back. What kid hasn’t been dared how much soft-serve can be consumed at the all-you-can-eat buffet? Whoever could eat the most ice cream the fastest and delay “brain freeze” the longest would be the victor. Stories would no doubt be told for summers to come about the volume of ice cream that was consumed on that glorious day. Why Host an Ice-Cream Challenge? If you’re all grown up and the volume of soft-serve you can throw down in front of neighborhood children is no longer impressive there may be perfectly logical reasons you still want to organize a food challenges into adulthood. The first reason… Food challenges can be great for business. If you’re the owner of a restaurant or food truck, your available marketing budget is probably near zero. As a result, you need to be creative in the way you get your name out there. Hosting and promoting a food challenge can be a great way to generate massive local exposure for little cost. Here’s a scenario. It’s not likely your local news team, newspaper, or bloggers will cover your ice cream shop just because your planning to open up shop next month. Unfortunately, opening a new store isn’t news. There are always new stores and restaurants opening around town and it’s not anything newsworthy (unless it’s a really small town!). At best you may get a small blurb in the local business section. But if your new ice cream shop is the home of the 5-foot sundae challenge made of 6 bananas, two pounds of soft-serve, a dozen different toppings, and needs to be eaten within 15-minutes to complete the test.. Well now you’ve got an interesting story to tell! This is the type of thing newspapers and bloggers alike love to talk about and share. The food challenge marketing approach is not limited to small cafes and restaurants though. Even multi-national food businesses can benefit from this approach. 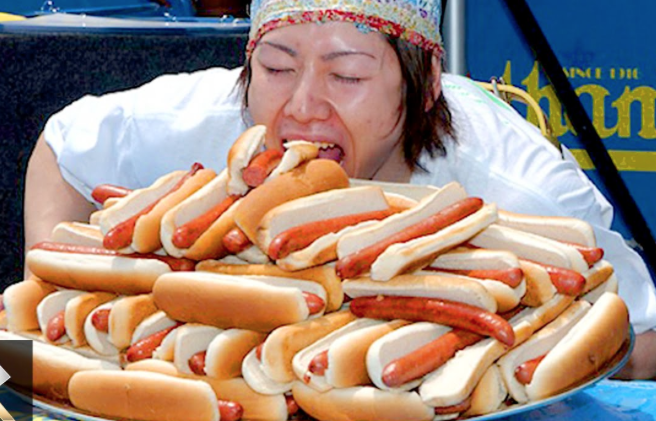 The most popular food challenge of all-time is the annual Hot Dog Eating Contest by Nathan’s Famous. This hot dog challenge has been going on for decades, some say as far back as 1916. Although the rules can change slightly year to year, the goal is the eat the most Nathan’s hot dogs (and keep them down) within a 10-minute time period. Over the years the popularity of this event has continued to grow. The contest is now broadcast on major cable networks each and attracts thousands of spectators to watch hot dogs be eaten. That’s some major promotional power for a food eating contest! Now that you understand the benefits of hosting a food challenge, it’s time to plan your own! Come up with a food challenge that’s related to the food you serve. If you specialize in selling hamburgers, you could try to make jumbo sized 2-pound patty with an enormous bun, all the fixes, and a heaping plate of french fires. Set the Rules for Winning. Next you’ll need to get super specific with the requirements of this food challenges. This will ensure that contestants aren’t confused as to how to approach the test. Requirements you’ll need to be clear on is the time limit allowed for the test, if contestants can drink water or other beverages make sure that’s specified. Determine the Prize. This is the fun part. Figure out what contestants will receive for successfully completing this achievement. Some restaurants put up photographs of winners to be admired by future guests. Other restaurants simply hand out a free t-shirt and a certificate of completion of the challenge. Get Consent. More information about this important step below, but we recommend having all contestants sign a waiver before participation. Promotion. After the rules of the contest have been decided, you’re final job is to promote the heck out of the event. If you have an annual events such as a hot dog eating contest, make sure to send out a press release and contact your local press to ensure they know when / where the event is happening. You can get even more value by promoting the accomplishments of the winner. Don’t forget to promote this on social media as well! If you don’t promote the event, you won’t receive any of the business benefits of running a contest. How much ice cream could you eat? Although food challenges are meant to be fun, it’s a wise decision to protect yourself from a legal perspective if you decide to host one if your restaurant. The best way to accomplish this is by having a consent for or waiver that is signed by eat contestant. The consent form should clearly outline any potential dangers associated with the contest. For example, you’ll want to include the ingredients that eaters will consume during the event, especially if they are known to cause allergies or reactions in some people. Here’s a food challenge consent form that looks legit. But hey, we’re not lawyers so consult a professional before using it. We hope this post has provided you with everything you ever wanted to know about ice-cream eating competitions. But here are a few more related articles, we recommend if you want to discover even more. Win an Ice Cream Challenge: Want the best strategies for winning an ice-cream competition as a contestant. This is the most comprehensive guide we’ve found on the topic. Ice Cream Truck Salary: Ever wonder how much an ice cream truck makes on average, per day? Find out here.